FIGURE 5-5 (A) Amino acid sequence of the a-subunit of ovine-bovine LH. The residues outside the circles show the substitutions reported in human and porcine a-chains. Those underlined are substitutions in porcine LH-a. The LH-a is similar to FSH-a and TSH-o. Reproduced from Pierce, J. G., Faith, M. R., Guidice, L. C., and Reeve, J. R. (1976). Ciba Found Symp. (Excerpta Medica) 41, 225-250. (B) General structure of the carbohydrate units of ovine luteotropin (OLH) and bovine TSH. 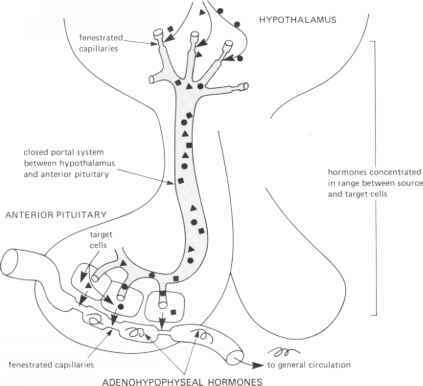 Carbohydrate structures of other anterior pituitary hormones (FSH) are similar. These structures are important since they play a role in the biological function of glycoprotein hormones, although they may not be critical for interaction of the hormone with its receptor. Reprinted by permission from Bedi, G. S., French, W. C., and Bahl, O. P. (1982). Structure of carbohydrate units of ovine luteinizing hormone. /. Biol Chem. 257, 4345-4355. © 1982 by The American Society of Biological Chemists, Inc.
pregnancy by the trophoblast to provide the hormonal stimulus for progesterone production (see Chapter 14). Interestingly, it is rather similar to LH but is distinct from FSH, and its antibody cross-reacts with LH. Consequently, a radioimmunoassay of circulating LH has been developed with the anti-hCG antibody. Human ACTH is 4500 molecular weight in a single chain consisting of 39 amino acids. It is structurally related to MSH and /3-lipotropin. All three hormones derive from the same gene product (see Figure 5-10). The sequence of human ACTH is given in Figure 511. Note that a-MSH is contained in the first 13 amino acid residues of ACTH.